Today was a very long day of driving. We woke up pretty early. It was -18F in Beaver Creek. 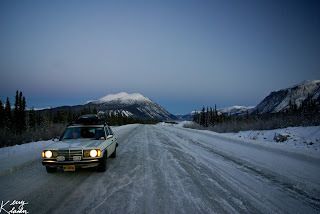 The first couple hours of driving were in the dark and was probably the worst section of the highway. 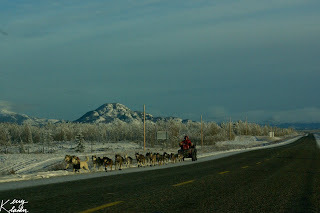 The road was like rough waves from all the frost heaves, similar to in the photo from yesterday, only larger. The sun came above the horizon a little after 10AM and the scenery was beautiful. 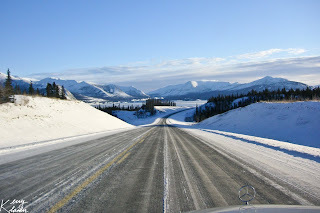 There is not much open in the winter along the Alcan. Almost every lodge and rest-stop we passed was snowed in and closed until Spring. If the tank falls below half way I start getting a little nervous, especially with it being so cold. After about 150 miles we stopped for breakfast in Destruction Bay, the first town with anything open. 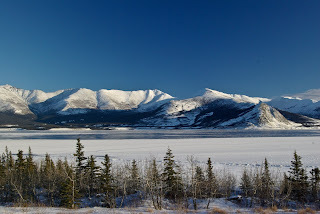 The town is located along the shore of Kluane Lake. It was sunny and warm. It was about 25F, about 45 degrees warmer than Beaver Creek. From Destruction Bay until Whitehorse, it was pretty smooth sailing. We were lucky enough to see half a dozen elk crossing the highway. Traffic was still minimal, but there were more cars than yesterday. 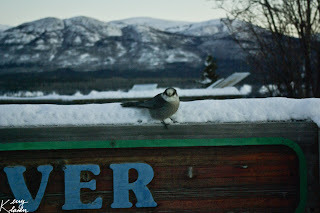 After leaving Whitehorse, it started to get dark again and with that came snow. The last few hours of the drive was dark. 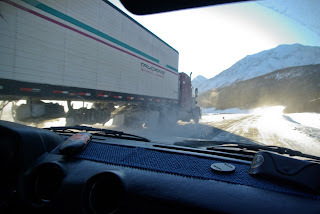 The truckers would come up on us quick from behind and blind us with snow clouds as they passed. Everything was white. It was like driving through a tunnel, all you could see was straight ahead and not very far. 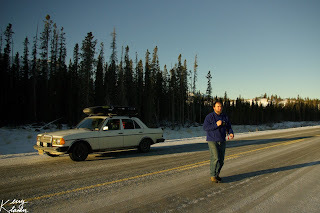 It was almost impossible to tell up from down except from the sound of the engine. 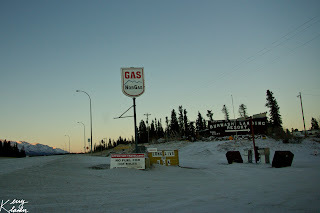 After driving about 555 miles, we arrived in Watson Lake a little after 8PM. The snow is still falling hard. 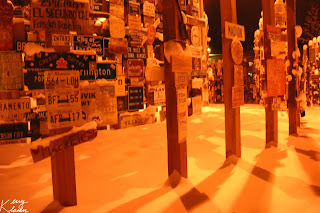 Tonight my father and I walked down the road to the famous sign forest. There are over 60,000 signs. My family left a sign there almost 20 years ago so we were trying to find it again. 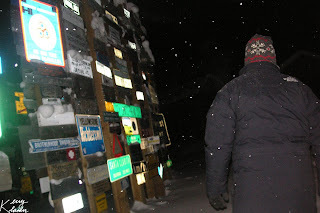 It was dark and snowy and there are a lot of new signs, so we didn’t have any luck finding it. We might try again in the morning.